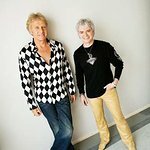 Air Supply are a duo made up of Russell Hitchcock and Graham Russell. Their hits include All Out Of Love and Making Love Out Of Nothing At All. Google trends for "Air Supply"
We don't have any videos related to Air Supply.